Our Green Chemistry Series has now been running for just over a decade. To mark this anniversary we asked the Editors of some of the first books in the Series whether they wanted to re-visit the topics of those books for an update. Professor Roberto Ballini from the University of Camerino was one such Editor. 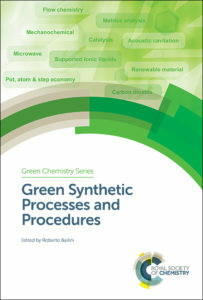 Here he has written a few words about his new book Green Synthetic Processes and Procedures. Back in 2009 the RSC commissioned me to act as editor for the book Eco-Friendly Synthesis of Fine Chemicals, a book dedicated to the concepts of Green Chemistry. The Book aroused a lot of interest and a very large number of copies were sold. A decade has passed since then, and there has been great growth in the field of Green Chemistry, both in the Industry and Academia. 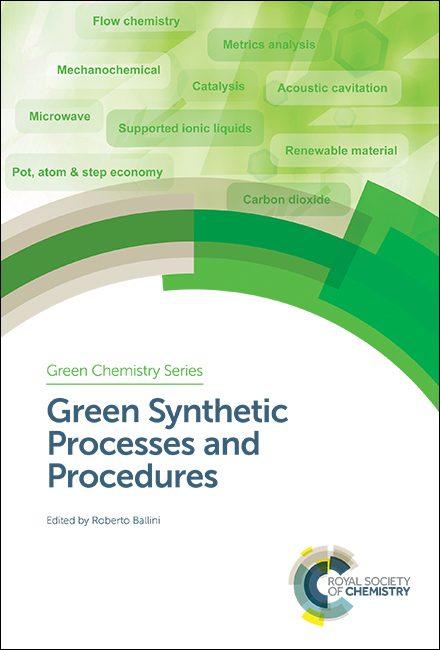 Providing a thorough overview of the current green synthetic topics, from biocatalysis to sonochemistry, the RSC once again asked me to organize, as Editor, the publication of a new book with the most recent advances in the field of Green Synthetic Processes and Procedures. The book will be published in July 2019 and is intended as a useful resource for any chemist wishing to design cleaner and safer procedures. Organized in fifteen chapters the book is dedicated to several of the main topics of Green Chemistry and is written by leading experts in the field. Chapter one provides an update on the concepts, the sustainability values and the new metrics of Green Chemistry. Chapter two treats the recent developments in One-Pot reactions, including cascade reactions, stepwise reactions and multicomponent reactions. Chapter three deals with the utility of step, cumulative and global E-factor and PMI (process mass intensity) metrics for the analysis of material efficiency with synthesis plans, with particular attention to pharmaceuticals. Chapters four and five report the advantages of Flow Chemistry. Chapter six illustrates a series of recent examples of combining multicomponent reactions with bio-catalysis and the use of renewable starting materials derived from biomass. Chapter seven aims to stimulate further progress in organic synthesis by describing harmless and green technologies, since hydrodynamic cavitation and ultrasound create unique, high-energy microenvironments. Chapters eight and nine describe the application of mechanical energy (mechanochemistry) to achieve chemical transformations for the preparation of important targets, including heterocycles, pharmaceuticals and agrochemicals. Chapter ten is devoted to synthesis under microwave heating conditions and neat reactions. In fact, the use of organic synthesis is one of the main causes of pollution and risk for humans. The use of microwave (MWs) for the heating of mixtures, the combination of solvent-free protocols and MWs-assisted organic synthesis is therefore the most challenging tool to abide by the 12 green principles. This chapter reports on recent reports, benefits and challenges of synergies between MW heating and neat reactions. Chapter twelve treats the micellar catalysis with transition metal complexes as one of the major tool in the organic chemist since it can be considered an important technology that allows the use of water as the reaction medium. The range of reactions in which micellar media can be successfully used, is very wide. 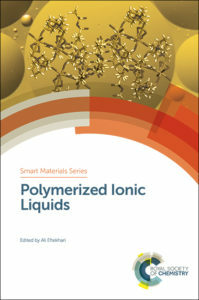 Chapter thirteen is dedicated to the advantages offered by the use of materials based on ionic liquids (ILs). Materials based on ILs can overcome many drawbacks observed in the classical Ionic Liquids and provides a substantial reduction in the amount of IL required for a given application. This decreases accordingly the associated cost, facilitates handling and manipulation and greatly mitigates the potential environmental risks. Chapter fourteen collects and describes representatives of the current literature on the use of CO2 and organic carbonates for sustainable valorization of renewable compounds. Chapter fifteen shows the breadth of transition metal-catalyzed methods (the catalyst can be recovered and recycled) in water for the addition of terminal alkynes to a variety of electrophiles. Thus the book provides a broad spectrum of recent advances and recent trends in sustainable synthesis. The volume will be very useful both for those involved in scientific research and in the dissemination of the Green Chemistry sector. You can view the full table of contents and pre-order this book through our website. Remember to check back once the book has been published when the first chapter will be available to read for free. 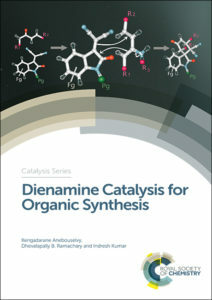 With the publication of Dienamine Catalysis for Organic Synthesis by Anebouselvy, Ramachary and Kumar, the Catalysis Series sees the milestone publication of its 30th book. The Series will also mark the ten-year anniversary of its first publication in June. Led by newly appointed Editor-in-chief Justin Hargreaves, the series covers both research developments and applications of catalysis. Since the publication of its first book, Carbons and Carbon Supported Catalysts in Hydroprocessing, the Series has covered topics including metal nanoparticles, hetergoneous gold catalysts and trends in cross-coupling. In the past decade, a new era in asymmetric catalysis has been realised by the discovery of L-proline induced chiral enamines from carbonyls. Building on the momentum of this rapidly expanding research area, Dienamine Catalysis for Organic Synthesis provides a comprehensive introduction, covering preformed dienamine species, in situ generation and applications in the synthesis of bioactive molecules and natural products. With the publication of Drug Discovery in Leishmaniasis by Luis Rivas and Carmen Gil, the Drug Discovery Series sees the milestone publication of 60 books in the series. Led by Editor in Chief David Thurston, the series covers all aspects of drug discovery and medicinal chemistry making use of expert case studies to accessibly detail both fundamental science and cutting-edge technologies. Since 2010 with the publication of Metabolism, Pharmacokinetics and Toxicity of Functional Groups the series has gone on to cover hot topics from nanomedicines and epigenetics to anti-aging drugs and green chemistry. View all 60 titles in the Drug Discovery Series. Our new book series, Food Chemistry, Function and Analysis has just launched its first publication, Food Biosensors. The series will focus on food chemistry, the functions of food in relation to health and analytical methods and approaches used by scientists in the area. All these are critically important in understanding food science and chemistry which will help to answer some of the biggest global challenges we face today which have food at their core. It is aimed at all levels from graduates to academic and industrial researchers in food science and chemistry, as well as others who work at the interface of chemistry, physics and the biology of food. Series editors, Professor Gary Williamson (University of Leeds, UK), Professor Alejandro G. Marangoni (University of Guelph, Canda) and Professor Juliet A. Gerrard (University of Auckland, New Zealand) will be leading the way. All are experts within this area and more information can be found about them by clicking the links in their names. The first book to be published under this new series is Food Biosensors. Biosensors are a key topic, as they offer a much quicker, more reliable and more versatile method for the detection of toxins, allergens, hormones, microorganisms, pesticides and other compounds. Covering fabrication of biosensors, the development of miniaturised devices as well as the latest applications in the food industry, the book is written by world renowned scientists and is edited by Professors Minhaz Uddin Ahmed, Mohammed Zourob and Eiichi Tamiya. This book is a key resource for food biotechnologists, food chemists and biosensor related students and researchers all over the world. Please keep an eye out for our future publications in 2017 within this exciting new book series. As a specialist publisher working with internationally respected authors, we support scientists, researchers, students and teachers with high quality, internationally respected chemical science books that span the breadth of our subject. Our collection is made up of over 1,500 books – and it’s growing. To explore our latest titles and find out what’s on the horizon, download your copy of our Books Catalogue. There’s a lot to look forward to in 2017.
explorations of the chemistry of daily life in The Chemical Story of Olive Oil, Coffee: Chemistry, Quality and Health, Poisons and Poisonings, and The Science Behind the Superheroes. And that’s just a taste of what’s waiting for you inside the catalogue. Would you prefer a print version of our Books Catalogue? Just send us your address and we’ll be happy to post one out to you. 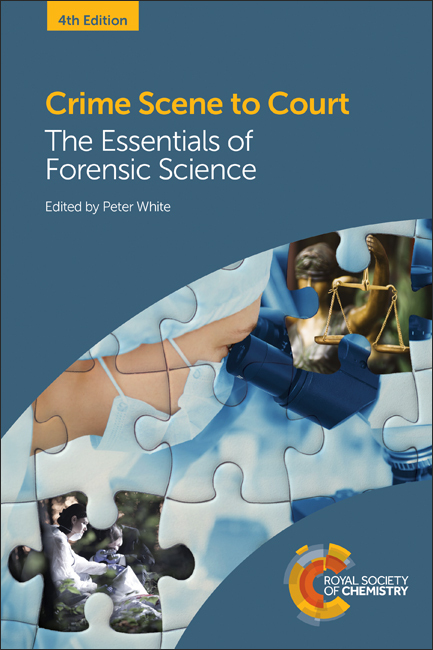 ‘Crime Scene to Court – The Essentials of Forensic Science’ has been essential reading for forensic science students for a number of years. As with previous iterations of this book, this fourth edition approaches subjects in a progressive, user-friendly way that should appeal to those with both a scientific and non- scientific background. As the title suggests, the reader is taken through the investigative process from the examination of the crime scene, through to the analysis of various evidence types, and then finally to the presentation of evidence in court by an expert witness. This fourth edition considers a range of evidence types, from traditional ones such as marks evidence, toxicology and trace evidence, to less traditional examples like forensic ecology. Unlike some forensic texts, each evidence type is written by experts in that particular field, who skilfully present their practitioner knowledge and experience with clarity. This new edition also includes chapters on ‘Identifying the Individual’ and ‘Digital Forensics’. The former predominately considers finger-mark evidence, and includes sections on cognitive bias and biometrics. With Digital Forensics expertly covering a range of topics including privacy laws, hacking, and the issues related to inspecting seized computers. As the digital world continues to develop, digital forensics is becoming increasingly more important within the criminal justice system, therefore its inclusion in this book should be applauded. The use of colour images in this edition greatly supports the readers understanding. For example their use in bloodstain pattern analysis allows clear comprehension of the directionality component of blood patterns, something that could be difficult in previous editions. In addition, the fact that most of the contributing authors are UK based should appeal to those with specific interest in how forensic science is applied within the UK legal framework – UK based students for example. In conclusion, this is an excellent book which I wholeheartedly recommend to anyone with an interest in forensic science, from the experienced practitioner to the curious layman. Crime Scene to Court (Fourth Edition) can be purchased here. The third edition of Green Chemistry: An Introductory Text discusses many topics in the field, including the provision of environmentally benign products from sustainable resources, legislation, renewable resources, catalysi s in green chemistry, and some industrial case studies. This book is aimed at undergraduate and postgraduate courses covering green chemistry, and is written by Mike Lancaster, who set up the Royal Society of Chemistry Green Chemistry Network and has more than 20 years’ experience in the chemical industry. Also of interest, the Royal Society of Chemistry Green Chemistry Journal is honouring the 25th anniversary of the term “green chemistry” by publishing an editorial each month in the year 2016 focusing on one of the twelve principles of green chemistry. Read the latest edition of our Green Chemistry Journal here.